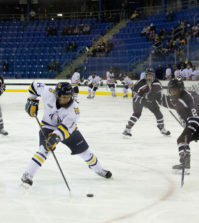 After breaking Quinnipiac’s program scoring record on Friday against Brown, freshman forward Kelly Babstock added to her goal total in women’s ice hockey’s 3-1 victory over Yale on Saturday. With the four-game winning streak, the Bobcats (13-6-1, 6-5-0 ECAC) moved into second place in the conference behind red-hot Cornell University, who has won nine straight. The Bobcats struck first with a power-play goal by Erica Uden Johansson with 11:40 left in the first period. Johansson’s eighth goal of the season was scored off a rebound from Bethany Dymarcyzk. Kate Wheeler was also credited with an assist on the play. The Bobcats outshot their nutmeg state rivals 14-2 in the first period. Yale’s offense seemed to wake up in the second period. After a face off win in their offensive zone, Bulldog defender Jamie Gray ripped a shot from the point that was deflected by Alyssa Zupon. Forward Aleca Hughes then knocked in the rebound 2:30 into the period to level the score at 1. Yale outshot Quinnipiac in the period, 15-9. Babstock then added to her record-setting season with her 17th goal of the year in the second period, which put the Bobcats up 2-1. With 15:57 left in the period, Babstock prevented the Bulldogs (4-8-2, 3-4-1 ECAC) from clearing the puck out of their zone. She then came toward the net from the goalie’s right side, deked around to her right and was tripped by a Yale defender. As she seemed to fly through the air, she never lost concentration and wristed the puck past Jackee Snikeris. The Yale netminder made 28 saves on the day, while her counterpart Victoria Vigilanti stopped 22 shots. Yale consistently played a man down. This continued in the third period. Twenty seconds into their sixth penalty, Bobcat defender Felica Vieweg sent the puck to forward Amanda Colin. Colin then found junior forward Jordan Elkins at the right point who sniped the puck to the back of the net. 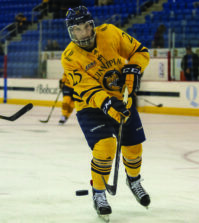 It was Elkins’ fourth goal of the season and the second power play goal of the day for Quinnipiac. It was also the 21st power play goal of the season for Quinnipiac, which ranks first in the conference. Babstock continued on her trek of paving the new single-season scoring record with another goal. The freshman forward tallied 15 goals in just her 19th collegiate game on Friday. As of Sunday she leads the entire nation in points with 36, which is four points ahead of Haley Irwin of Minnesota-Duluth. Babstock also leads the nation in game-winning goals as she collected her sixth of the year Saturday. 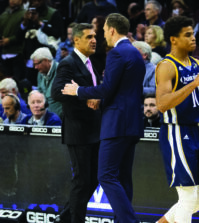 The Bobcats will look to continue their winning streak on the road against Princeton, St. Lawrence and Clarkson before returning home on Jan. 18. 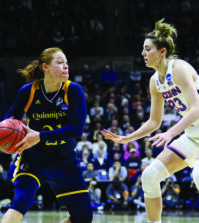 “I don’t think we’ve ever won at any of those places but it’s a challenge this program is ready to face,” Seeley said.